Maharaj Kumar Lakshyaraj Singh Mewar, the Hon'ble Prince of Udaipur has made his way into the Guinness Book of World Record for the largest collection of clothes for recycle/donation. 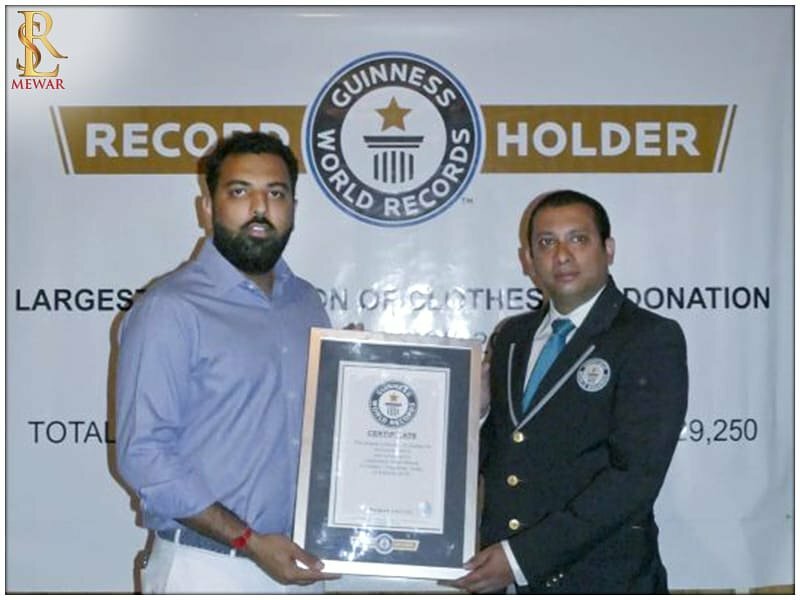 Guinness Book of World RecordCategory:Ministry of Tourism, Government of India. 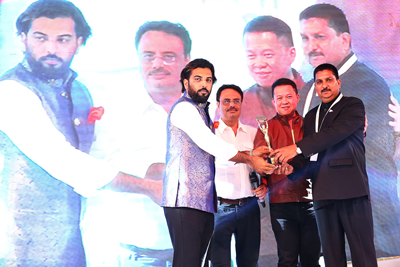 As the Executive Director of the HRH Group of Hotels, Lakshyaraj Singh Mewar received the Young Hotelier of the Year 2018 Award for outstanding service and setting new standards in the world of hospitality. Young Hotelier of the Year 2018 Category:Ministry of Tourism, Government of India. 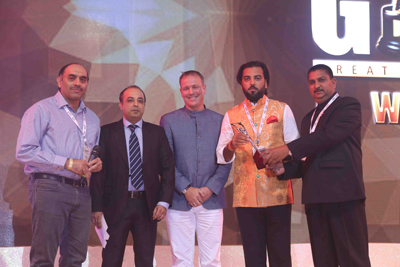 As the Executive Director of the HRH Group of Hotels, Lakshyaraj Singh Mewar received the National Tourism Award 2015-16 for Fateh Prakash Palace under the category of the Best Heritage Hotel- Grand Category. National Tourism Award 2015 and 2016Category:Ministry of Tourism, Government of India. Being honoured for his contribution towards the Indian Heritage Hotels and receiving an award for promoting the Royal Wedding destination in Rajasthan. This award was bestowed upon him by Dr. Mahesh Sharma, Hon’ble Minister of Tourism and Culture (IC), Government of India. Promoting the Royal Wedding destination in RajasthanCategory:by Dr. Mahesh Sharma, Hon’ble Minister of Tourism and Culture (IC), Government of India. National Tourism Award 2014 and 2015Category:Ministry of Tourism, Government of India. National Tourism Award 2014 and 2015 to Fateh Prakash Palace, Udaipur for the Best Heritage Hotel in Heritage Grand Category by the Ministry of Tourism, Government of India. 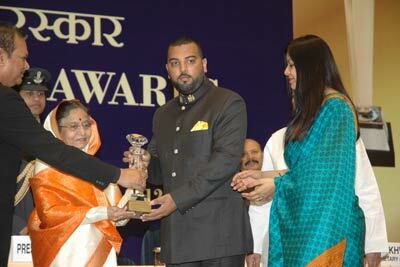 Category:Best Wedding Venue Banquet/Backward"Gold Award:Jagmandir"
Category: Best Wedding Hotel"Gold Award:Shiv Niwas Palace"
Maharaj Kumar Lakshyaraj Singh Mewar of Udaipur has been awarded with “Young Achievers Award of The Year” by the National Awards for Excellence in Hotel Industry in an award ceremony at TAJ Lands End Mumbai on 26th July 2015. Maharaj Kumar Sahib’s representative received this award on his behalf. You can refer the website www.cmoasia.org for more information. We do not have photograph of this award. The Person Presented this award was Dr. Saugata Mitra, Chief People Officer & Group – HR Head, Mother Dairy Fruit &Vegetable Pvt. Ltd.
As the Executive Director of the HRH Group of Hotels, Lakshyaraj Singh Mewar’s perseverance and dedication was validated in him receiving the Great Indian Wedding Award on behalf of HRH for the year 2014 in the category, ‘Best Wedding Venue’. This award, in the Gold Category, was accredited to his revolutionary work in revitalizing the Jagmandir Island Palace into the foremost and iconic wedding destination in the world. 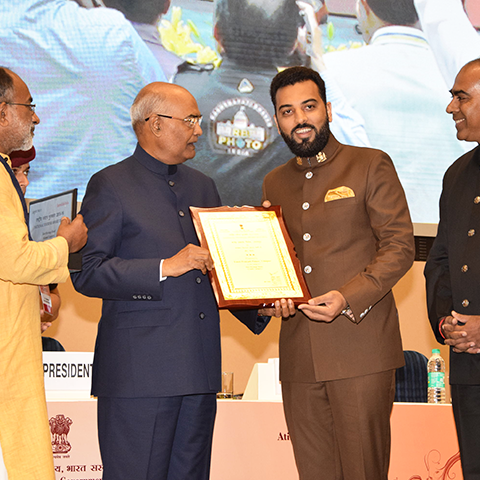 His remarkable work on the Manek Chowk Palace also resulted in receiving an award in the silver category for being the best and popular wedding venues in India. Consequently, the Hotel Shiv Niwas Palace and Hotel Fateh Prakash Palace in Udaipur were also granted honors as the Best Wedding Hotels in India. 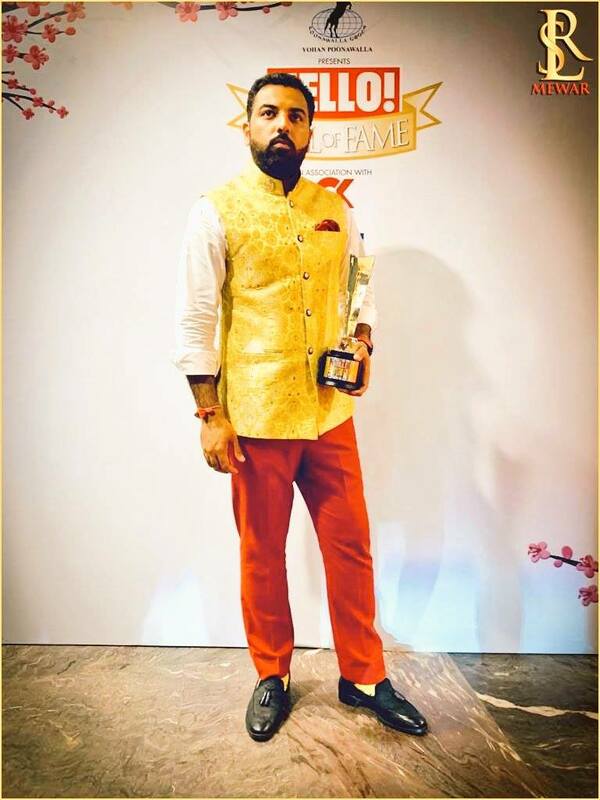 These awards were presented during the ICWF (International Convention of the Wedding Fraternity) event held on 21st August 2014 at the Grand Hyatt, Goa, marking a memorable moment in Lakshyaraj Singh Mewar’s life. 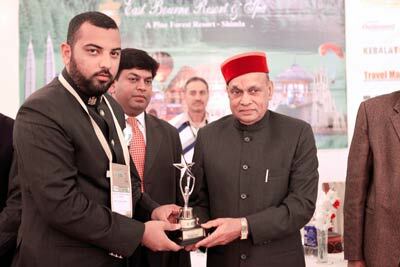 Lakshyaraj received the International Tourism Conclave and Travel Award for the category, the ‘Best Heritage Hotel’, from the Hon’ble Chief Minister of Himachal Pradesh, Prof. Prem Kumar Dhumal, on behalf of HRH group of hotels. 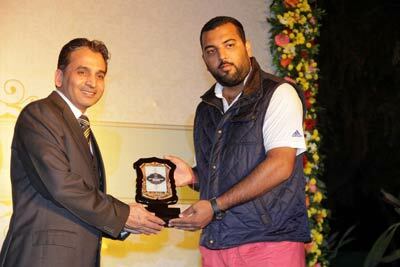 With over 30 winners from this prestigious award from a survey conducted on over 5000 representatives in Udaipur from various sectors, it comes as no surprise that the ‘Face of Mewar’ award was endowed on Lakshyaraj Singh Mewar, following his inspirational and eulogistic work for his people and society at large. Hosted at the East Bourne Resorts and Spa, Khallini, Shimla, Himachal Pradesh. The ITCTA is one of the most significant and largest platforms for B2B meetings. The Mewars have always been acknowledged for their respect, promotion and protection of their culture and heritage. 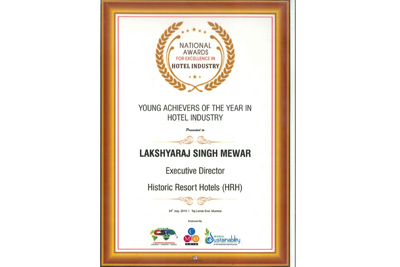 It therefore is fitting that, on behalf of HRH, Lakshyaraj Singh Mewar received the National Tourism Award under the category, ‘Best Heritage Hotel (Grand)’ for the year 2010-2011 for the Shiv Niwas Palace. It is of utmost honour for the prince to receive the award from the Hon’ble President of India, H.E Smt. Pratibha Devisingh Patil and Minister of Tourism, Government of India, Mr. Subodh Kant Sahay at Vigyan Bhawan in New Delhi, organized by the Ministry of Tourism, Government of India. This hotel takes the pride of being awarded for the best heritage hotel since 1997.